I have finished 16 blocks so I am almost up to date. The picture shows some of the blocks laid out on the white fabric that I will be using for the sashing in between the blocks. I am using fabrics from Amy Butler's Midwest Modern and Daisy Chain collection. Although I really like these fabrics, I have had difficulty using some of these ultra bright pinks, oranges, blues and greens in my quilts. But I think the colors are working well together here! I love the white centers pulling everything together. It gives it a coherent look even with all the different fabrics. It is looking very good, I love the colours you've used and the white is good with them. 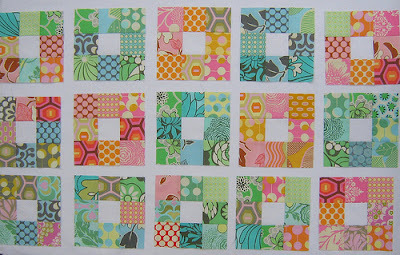 looks so sweet, I love your use of white and dream of experimenting with black and some bright colours, Fassett scraps? I love your white centers. I think I am going to be loving the "variations" of the quilt-along the best. Gorgeous! I love the slightly different ones, like the 9 patches all the same fabric of with a white centre like yours. Love the bright colours. I really like the fabrics you are using and love how you chose to do the nine patch...looks beautiful so far! That's really pretty - I love the white centers - it makes the colors pop! They look just fabulous! I love ultra bright pinks!! WOW!!! Again, the center white block is the perfect thing to bring them together. I really have to remeber that for a future quilt. And the colors are great with just a bit of brightness. Wow, you are so clever to put a white centre in and then use all different fabrics...a touch of genius! As Always, great fabrics, great style, great start! It's so pretty and inspiring! I can't wait til I have more time to start quilting. I love the white centers! It gives the 9 patch a whole different look. they are wonderful! i adore the white centers, too. now THIS is what i should do with my flea market fancy stash. They look great! What an interesting layout. I love it. Oh, I love that you're using the white centers. Your quilt will have a very different look than the rest of them! oh my gosh - these are so gorgeous! I love them! The colors are so cheery and bright. It is going to be an amazing quilt! Oh.! They ARE Working Very Well Together...they look Great.!! You are an amazing quilter. I was linked to your site via someone else's blog and I have been admiring all your work. I can't get over how beautiful your quilts are. I love the white centres. I bought a charm pack to add to the 9 patch but realized after that I can only get 4 squares from each of them. Your quilt would be a terrific solution for charm packs. Thanks for the great idea! I'm doing the quilt-along too and I'm using fabrics I've had in my stash for over 10 years. But I've been trying to figure out what to do with my midwest modern stash. I might just have to do this same thing. Really I could take any of your ideas, they're totally my style. Thanks! Beautiful! 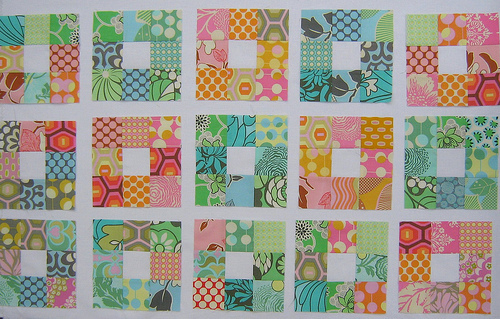 I love the white centers -- especially on your "all cool" or "all warm" blocks. This is going to be a gorgeous quilt! I'm not sure how much longer I'm going to be able to resist this quilt-along. . . I love the white centers. Your quilt is looking fantastic.